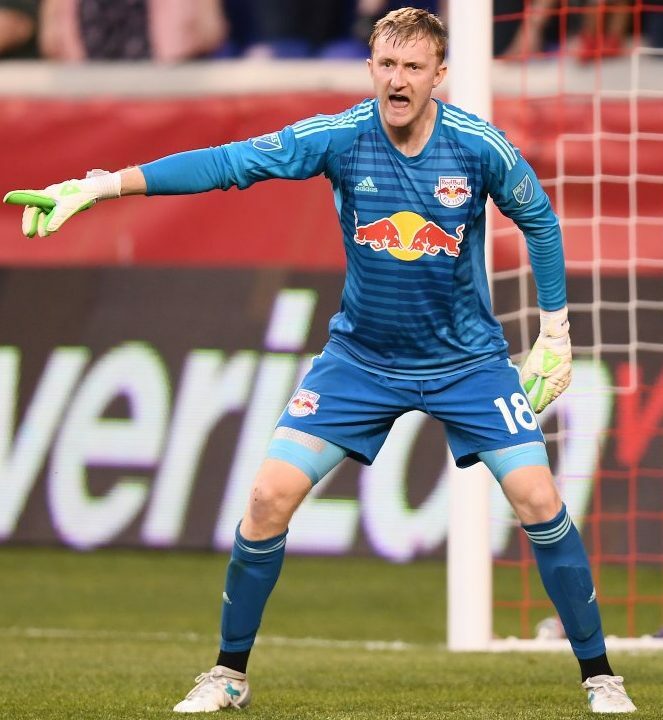 Harrison, NJ—May 26, 2018– Despite another strong performance by backup goalkeeper Ryan Meara the New York Red Bulls could not figure out the defense of the Philadelphia Union last night as the home side settled for a 0-0 draw at Red Bull Arena. The first draw of the season for Jesse Marsch’s club snapped a 4-game winning streak for New York but did get them a point closer to the top of the table in the Eastern Conference. However, the result was extremely disappointing for the Red Bulls who had averaged 2.6 goals per game so far in 2018. One very familiar face in the Red Bulls lineup which not many fans had expected to see after the scenes one week ago in Atlanta was defender Kemar Lawrence. It certainly didn’t look good for the Jamaican international when he was carted off in a neck brace against Atlanta United. However after all tests came back negative, head coach Jesse Marsch reported that Lawrence was feeling good and in good spirits, and was ready to go for the game Saturday. Chances on goal were few and far between in the first 15 minutes of the match, despite the home side having a majority of the possession. The home side would get its first significant chance in the 13th minute when Kaku fired a shot from the top of the box, which was caught in a majestic diving save by Philadelphia keeper Andre Blake. The Union would respond in the 18th minute when a shot by midfielder Marcus Epps was cleared off the line by a Tim Parker header. In the 29th minute Ryan Meara would come up huge again. The longtime Red Bulls backup who was starting his second consecutive match in replace of an injured Luis Robles, came out aggressively to deny Epps again, this time on a breakaway to keep the game even at 0-0. The home side appeared to break through in the 29th minute when striker Bradley Wright-Phillips hit a toe poke into the bottom left corner of the net. The celebration was short lived when BWP was ruled to be offside on the play, and a very even first half came to a close scoreless. Early into the second half the visitors were given a golden opportunity to take the lead, when a shot by Epps struck the hand of Red Bulls defender Kemar Lawrence in the box earning the Union a penalty kick. But Lawrence and the Red Bulls were saved when the usually reliable finisher CJ Sapong, sent Meara the wrong way but completely missed the net sending the shot wide of the right-hand post. The remainder of the second half provided very few chances despite the efforts of Alex Muyl, Carlos Rivas and Vincent Bezecourt off the bench the Red Bulls could not break through, and when the final whistle blew on a hot and humid night in Harrison, both teams would come away with 1 point. After the match, Jesse Marsch credited the Philadelphia Union’s players and tactics for his team’s first shutout since the away loss to Real Salt Lake. But he also credited his team for getting a point after a tough match in tough weather conditions. “There have been many times in the past where this team would’ve given this game away…we’ll take the point and move on” said Marsch who will certainly have his team tested in the near future. The Red Bulls will now go into a tough stretch playing three matches in the next seven days. New York will go back on the road next weekend against the New England Revolution before returning home for a U.S. Open Cup against rivals NYCFC on Wednesday before traveling for a top of the table clash against Columbus. The depth will certainly be tested with several players missing many of the upcoming matches. Michael Murillo who played all 90 minutes again Saturday will be leaving to join Panama’s National team who will be going to the FIFA World Cup next moth in Russia, while Kaku and Derrick Etienne Jr. and potentially Tyler Adams will be reporting for friendlies with their respective home nations. However, no matter the squad available to Jesse Marsch for next weekend at Foxboro, the expectation will be the same; coming home with 3 points.